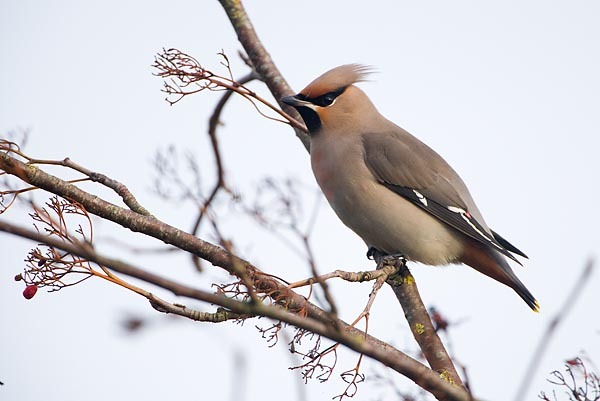 It seems that the major waxwing migration has started, lasting until December. We will see how many stay on here for the winter but in some years they have been quite numerous winterers, up to some twenty thousand. In size the waxwings are similar to blackbirds and even the flight image is rather similar. Beautiful birds, a proud crest on the top of the head. The adult birds have a silky, gleaming plumage, basic colours reddish brown and grey. The eyes have a black stripe and there is a black patch on the throat too; the beak is powerful with a slightly hooked tip. Wing feathers are black with yellow and white patches and the tips of the primaries yellow, quite as the tip of the tail – a quite colourful picture. About differences between young and adult birds it can be said that the young lack the black patch on the throat and the silky sheen is duller. The flight of a flock is accompanied by the characteristic ceaseless quiet zirring or ringing sound. The flocks of beautiful birds keep busy without fear of people and when disturbed often only fly to a neighbouring tree. These nesters from the tundra and taiga zones do not meet many humans during summer, and so they are fearless. Feeding habits are voracious. A flock can empty out a rowan, juniper, wild rose, aronia or hawthorn in a short time, leaving the ground under the trees or shrubs thickly covered with berry rubble.